Category Archives: you can freeze it! Posted by cookcanread in baking, chocolate, cookies & bars, you can freeze it! Most weekends I bake something for my husband to take with his lunch during the week. We went through an extended granola bar phase before he asked for a change– could I make some cookies instead? I often lack the patience for cookies… you need to chill and find parchment and (heaven forbid) roll, or scoop, and then time and wait and do it again. I made bar cookies for a while as a compromise: brownies and chippy cookie bars, sometimes Scotcharoos or jam bars. One Sunday, as I prepped the pan for another batch of bars, my husband asked, quietly and kindly, if I could do something different. He was grateful for the bar cookies, but hoping for something new. Oatmeal cookies, or maybe peanut butter? We had a hard time deciding which ones, so I pulled out this recipe, which combines the best elements of those classics, plus chocolate chips for good measure. An everything cookie covers all the bases, and they are so delicious I don’t mind the chilling, dropping or waiting. I have seen other wonderful versions of this cookie: my Aunt J’s famous triple chippers, my friend M’s dangerously good recipe with Speculoos (cookie butter) and white chocolate chips. My recipe uses ingredients I almost always have on hand; peanut butter chips are the only grocery list item, most of the time. My husband likes them because they are substantial, even filling, which is good when you are looking for a sweet snack that counts a little more than just a quick sugar rush. Of course, they taste great. The base of the cookie reminds me of Girl Scout Do-Si-Dos, the peanut butter and oatmeal sandwich cookies, enough that someday I would like to try making these smaller, without the chips, with a peanut butter filling… But I am getting ahead. And perhaps gilding the proverbial lily, since I find these everything cookies satisfying and tasty exactly as-is. A bit of peanut butter, a bit of chocolate, held together by just enough oatmeal to make them interesting… it’s a pretty perfect combination. Next time you are in the mood to make cookies, especially if you find yourself waffling between oatmeal, peanut butter, or chocolate chip, why not avoid the decision by incorporating elements of all three? Give everything cookies a try. In the bowl of a stand mixer, cream together the butter, peanut butter, salt, sugar and brown sugar until light and fluffy, about 5 mins. Stop the mixer and scrape the sides of the bowl at least once. Add the vanilla and eggs and mix until combined, another 1 – 2 mins. Sift together the flour and baking powder. Add to the bowl and mix just until combined, or almost combined. Add both kinds of chips and the oats to the bowl. Mix on low speed until incorporated. If the thick dough is taxing your mixer, you can do this last step with a wooden spoon. Cover the bowl and refrigerate your dough for at least 2 hours and up to 2 days. Don’t skip this step. When you are ready to bake, preheat the oven to 375 degrees. Cover 2 – 3 cookie sheets with parchment paper or silicone liners. Drop the cookies onto the prepared pans. I like to use a #30 scoop for these, which holds 2 T. dough. Using this size scoop yields about 40 generous cookies. Leave space in between the cookies for spreading. I put 10-12 cookies on a sheet. My oven does best baking one sheet at a time. Bake for 12-14 mins. to yield soft-in-the-middle cookies. Add 2-3 mins. to the baking time for a crisper cookie. If you used a smaller scoop, start with 10 mins. and see how you like the results. Slide the parchment off the pan onto a rack or the counter to cool. The cookies will keep in a covered container at room temperature for about 5 days. I like them best after a few days. They also freeze beautifully and will keep in the freezer for about 3 months. Posted by cookcanread in beans & legumes, meat & fish, spice, you can freeze it! The best part about writing a food blog is talking with folks about their favorite recipes. Last week, I was frustrated by a meal plan that looked similar to what I had been buying, cooking and eating for weeks. A quick poll on Facebook was enough to remind me about a great pumpkin soup I like to make this time of year, comforting cabbage rolls, and chili. Chili! I hadn’t made one for ages, and there’s no good reason– I have a great recipe, it is easy as anything, and it always tastes so good, especially when you stash it away for a few days. My recipe uses ground beef, kidney beans, medium heat from jalapenos and deep, dark stout. It’s crock pot friendly, but easy enough to do on the stovetop. We have been buying ground beef from Crowd Cow; I am consistently impressed by the quality and flavor of our purchases. If you are in the western US, I can’t recommend them enough. I find the ground beef they sell is just fatty enough to work very well here– you don’t have to drain off extra grease– and stays tender and flavorful. For kidney beans, I use a can, though you could cook them up yourself. Pinto and cannelini make fine substitutes for kidney beans, if needed. When available, I use jalapenos I pickle myself to provide a little heat. The pickling mellows them some, and I don’t mind the fire to begin with. You can use canned jalapenos or a few diced fresh, with or without seeds. I wouldn’t leave them out altogether, but feel free to dial it down if you are concerned about heat. And now for the stout. It just seems to make this chili, adding depth and flavor I can’t replicate without it. The chili does not taste “beery” at all. Look for an imperial stout without vanilla notes, which can make it too sweet, but a coffee or chocolate note won’t hurt your chili a bit. Guinness is an easy-to-find classic in most areas. My strategy with chili is to make it Saturday and put it in the refrigerator until at least Sunday night, usually mid-week. It heats up quickly and easily, and you can freeze a portion for up to 3 months if you want. When you are ready to serve, a garnish of shredded cheddar cheese, sour cream, cilantro, scallions– or all of the above– makes for a hearty, delicious dinner. I am so glad I asked my Facebook group about meal planning– thanks again, Julie, for reminding me how fantastic it is to have a pot of chili bubbling away on the stove. Heat a large stockpot or Dutch oven over medium-high heat. Add the canola oil, then the ground beef. Use a wooden spoon to break the meat up. Cook for a few minutes, then add the onions, stir, and cook for 5-10 mins, until the beef is brown. Add the garlic, chili powder, cumin, oregano and salt and cook for another 1-2 mins. Stir in the jalapenos, then the stout. The beer will foam up at first; stir until it settles down, then add the tomato paste and fire-roasted tomatoes, with all the juices from the canned tomatoes, and the kidney beans. Stir to combine and wait for the chili to start bubbling. When it does, lower the heat to medium, cover the pot, leaving a steam vent on one side, and simmer for 30 mins. At that point, you can taste and adjust seasoning to serve immediately… but it really is better to cool completely, allow the chili to meld in the refrigerator for a day or three, and reheat and serve then. Whatever you decide, this is a mighty fine bowl. Ricotta pound cake with pears and dark chocolate. Posted by cookcanread in baking, cheese, chocolate, dessert, fruit, you can freeze it! This is a variation of a favorite, blueberry lavender ricotta pound cake. I happened to read back through that post recently and was inspired all over again– it is a wonderful loaf cake, easy to make and with a decadently moist texture and delicate crumb. I quickly thought of the flavors I wanted to use to give it an autumnal update. I had some Bartlett pears that were a little past the point of eating plain, and a memory of a lovely chocolate pear cake from smitten kitchen. I thought adding some brown sugar would lend a caramel note, cinnamon would give that warm spice I love in fall baking, and cider could play up the pear flavor while providing a little bit of acidity. My updates worked like a charm: this ricotta pound cake is rich from the vanilla and brown sugar, but the pear and chocolate are stars. Like the blueberry lavender loaf, it is a great cake to serve with coffee or tea; it keeps nicely in the refrigerator and can be frozen. I am now tempted to create a version of this pound cake for every season– and I believe we will all benefit if I do. Preheat the oven to 350 degrees. Butter or spray two 8″ x 4″ loaf pans and set aside. In the bowl of a stand mixer, cream together the butter, ricotta and sugars until light and fluffy. Add the eggs one at a time, mixing well between each addition. Core and cut the pear; place immediately in a small bowl with the cider and vanilla. This will prevent browning and infuse some of the flavors into the pear pieces. Sift together the flour, cornstarch, cinnamon, baking powder and salt. Remove the bowl from the mixer and add the dry ingredients to the wet ingredients. Add the pears and all soaking liquid in the bowl, and the chocolate chips. Fold the batter until the pears are incorporated and no dry ingredients are visible in the batter. Don’t overmix. Divide the batter evenly between the two prepared pans. Bake for 45-55 mins., rotating the pans after about 20 mins. ; the cakes are done when they begin to pull away from the sides of the pans and a knife comes clean from the center. Cool on a rack for at least 20 mins. before attempting to remove from the pan. Your ricotta pound cake will keep, tightly wrapped, at room temperature for up to three days and in the refrigerator for slightly longer. Bring to room temperature before serving, for best results. Posted by cookcanread in baking, fruit, you can freeze it! I think this is going to be a blueberry-heavy summer, which is very good news. The local berries were ready early this year (in late June actually, which surprised me) and have been sweet because of a nice balance of sun and rain. I’ve made blueberry scones and my beloved blueberry muffins already, had half a metric ton plain and on yogurt, and have plans for a few more baking projects in the weeks to come. All quite delicious, as you know… yet they pale in comparison to my very favorite summer blueberry cake. I was surprised to find I hadn’t yet shared this recipe. With the first sighting of local berries at the market, I begin to think about the first blueberry cake of the year. If I said before that a cake was my ‘very favorite’, I was not being honest. (Sorry.) My Nana’s chocolate cake comes close, and my Mom’s coconut cake merits consideration, but I would pass up most every dessert offered in favor of a piece of this blueberry cake. No surprise, it’s another recipe passed along by Mom. We used to vacation in mid-August on a lake in central Maine; my memories of those trips include pumping drinking water from the well down the street, swimming in the impossibly clear, cold lake with my brother, learning to play hearts at the giant kitchen bench/table, picking blackberries along the railroad tracks, and eating blueberry cake. Some of Mom’s cakes were made with coveted wild Maine blueberries… which might explain why it’s the only food I remember from those two-week long trips. Besides onion dip, and bacon for breakfast. Blueberry cake was way more important than either of those. The best part of summer blueberry cake is the deep golden brown, delicately crisp top layer, helped along in part by folding beaten egg whites into the batter– an extra, yet necessary, step. (I’d like to think alchemy has a role as well.) The texture of the cake is dense but never dry, and it improves daily, becoming richer, as unctuous as a cake ever should be, perfumed by vanilla and all the berries… Can you tell yet how much I adore this cake? I don’t mess around with greatness, down to using the same Pyrex pan each and every time. In the past I have experimented, as I so often do: with the addition of lemon zest, for instance (I like it better without), or by doubling the recipe to make a layer cake with cream cheese frosting (too sweet, not necessary). My one occasional twist to the original recipe: a handful of blackberries or raspberries added to the mix. Blueberries must be present– it’s just not the same made exclusively with another berry– but a mix does work. My husband and I recently discovered nectarberries; conflicting sources describe them as a descendant of Australian youngberries, or as a boysenberry-blackberry hybrid. I stopped researching so I could eat more nectarberries. They are divine, no matter what they are– giant, juicy and tart, with a flavor somewhere between blackberry and strawberry. With blackberries still a week or so away from being plentiful, a handful of nectarberries went into the cake pictured. With blueberries or mixed berries, I adore this cake as a brunch option or coffee accompaniment. You’ll see that the flavor and texture are reminiscent of a good bakery muffin, so it’s not a stretch to cut a little piece for a morning treat. When I shared the recipe for my Mom’s blueberry muffins, I was thrilled by the positive reaction and enthusiastic comments I got from those of you who made a batch. It is heartwarming to see a recipe so dear to me embraced and enjoyed by my community! I feel like this summer blueberry cake, my very favorite cake, is going to be another recipe like that. It’s not just the blueberry factor– this cake is tried and tested, loved and shared, as a great recipe should be. So, please, help me continue to pass it along. Preheat the oven to 350 degrees. Lightly grease an 8″ x 8″ square pan, preferably glass. Add the egg whites to the (very clean) bowl of a stand mixer. Beat on high until the whites hold a soft peak when you raise the beater up, about 2-4 mins. Add 1/4 c. sugar to the whites and mix on high for another 30 seconds, just to incorporate. Transfer the beaten whites to a small, clean bowl. Into the same mixer bowl, add the remaining 3/4 c. sugar and shortening. Using the same beater attachment, mix on medium high until light and fluffy; add egg yolks and mix again. Scrape down the sides of the bowl, add the vanilla, and mix once more. Sift together the flour, baking powder and salt. Add the dry ingredients to the shortening mixture in two batches, alternating with milk. Stop before the batter is fully mixed; remove the bowl from the mixer, scrape off the beater, and add blueberries and beaten egg whites to the bowl. Use your spatula to fold the batter together; stop when the egg whites are very evenly distributed, but still visible in streaks. Work to keep as much air in the batter as you can. Spoon half the batter into the pan and dot with blackberries or raspberries, etc., if using. Cover with the remaining batter and smooth it into all corners of the pan. Bake for 45-50 mins., until golden brown. A skewer inserted into the center of the cake will come out clean– unless you hit a berry. Cool slightly before serving. I think this blueberry cake is perfect as-is, but a small scoop of vanilla ice cream probably wouldn’t hurt. The cake will keep covered at room temperature for 2-3 days and in the refrigerator for a little longer. Mom says it freezes like a dream– we’ll have to trust her word, because I’ve never had one make it to the freezer in my house. *A note about shortening. I use it sparingly, but it really is the best fat for this cake. Nutiva and Spectrum make shortenings that are organic, non-GMO and transfat-free. If you prefer not to bake with shortening, an equal amount of butter will yield decent results, and I’m tempted to test a coconut oil version. But do consider using shortening to experience the cake at its best. Posted by cookcanread in baking, bread, fruit, vegetables, you can freeze it! There is a French bakery called Petit Pierre a few blocks from work. The proprietor speaks with a thick accent, his wife helps fill the case with shiny croissants, perfect fruit tarts and buttery cookies, and the barista makes a mean latte. It’s a beautiful space and I enjoy checking in Friday mornings for a treat to power me through to the weekend. The pastry case is updated seasonally: apple cake in the fall, strawberries and raspberries showing up now. Somewhere toward the end of winter or in early spring, morning glory muffins appeared. Suddenly, despite the macarons, cinnamon rolls and homemade pop tarts positioned to steal my attention, my eyes went straight to those muffins every time, and they became my Friday standard. Wrapped in craft paper, full of coconut, raisins, and apple, and topped with a basic icing and some toasted coconut shreds, Petit Pierre’s morning glory muffins are sweet, hearty, and so flavorful. Though not the kind of baked good I typically associate with a French bakery, the muffins are a welcome option, a good balance to all the lacquered fruit and buttery doughs. I was inspired to try my making my own at home. I discovered morning glory muffins in college and had a brief but passionate love affair. You know that I love food with interesting textures and diverse flavors. Morning glory muffins seem so wholesome and healthful, but the combination of fruit and coconut flakes also makes them sweet and a little exotic. I always felt like I was eating unfrosted carrot cake for breakfast. What a feat! My favorite aspect of the ones I remember from college was pineapple: every few bites, you would encounter a big chunk of pineapple, and I thought that was the best thing ever. My morning glory breakfast bread recipe replaces the more common grated apple with pieces of pineapple for that reason. For this particular recipe I thought a quickbread loaf was in order. I have some einkorn flour from Bluebird Grain Farms and really wanted to use that here; I knew I could use it in a quickbread with no other recipe modifications. Einkorn flour is the world’s most ancient wheat. The grain has never been hybridized and lacks some of the proteins that bother folks with gluten sensitivity. I like that it tastes of vanilla and produces a comparably light crumb, while giving me health benefits like I would get from sturdy, “regular” whole wheat flour. (If you don’t have einkorn flour, substitute the same amount of whole wheat or even white flour.) My instinct was that a larger loaf made with einkorn flour would be less inclined to have a dry texture than muffins. I also like quick breads because I can slice off just a sliver, just a taste. Muffins seem like a predetermined portion– who wraps up half a muffin to save for later? I’m kidding, but not entirely. I enjoy a toasted slice of morning glory bread with my coffee in the morning. It’s so pretty to see all the fruit and coconut pieces in cross section. I’ve seen morning glory muffins snidely called “hippie food”, “health store breakfast” and similar. Sure, they are full of fruit, healthful coconut and whole wheat flour… but I think that is a limited view of this combination of ingredients I enjoy so much. The flavors of pineapple, vanilla, raisins, coconut, cinnamon and ginger, all together in one perfect bite– I can’t think of many better options for a morning treat. Give my morning glory breakfast bread a try and see if you agree. Preheat the oven to 350 degrees. Prepare two 8 x 5″ loaf pans by spraying or oiling them lightly. Set aside. In a small bowl, soak the raisins in orange juice. If the pineapple you are using is juicy enough to gather 1/4 c., substitute pineapple juice for orange, if you like. Sift together the einkorn flour, baking soda, cinnamon, ginger and salt. In a large bowl, mix the oil and brown sugar until the sugar is dissolved. Whisk in the eggs, one at a time, until well combined. Stir in the vanilla, grated carrot, pineapple, coconut and raisins, with all of the soaking liquid as well. Add the dry ingredients and stir just until combined. Don’t overmix, as it will toughen your final product. Divide the batter between two loaf pans. Bake for 35-45 mins., until a skewer comes out clean from the center of each loaf. I rotate my loaves in the oven about 20 mins. into baking to ensure even cooking. Cool slightly before serving. Morning glory breakfast bread will keep tightly wrapped or covered at room temperature for about 5 days. You can also wrap it securely in wax paper, parchment paper, tin foil and freeze for up to 3 months. Black cherry balsamic chocolate fudge. Posted by cookcanread in candy & sweets, you can freeze it! My friend M first told me about her balsamic fudge recipe several years ago. I added it to my to-make list of holiday treats, but that list is/was so long it got shuffled to the bottom and then pushed to the “wait until next year” pile. Then, my thoughtful mom sent me some black cherry balsamic vinegar from Monadnock Oil & Vinegar, a shop she discovered during her annual Veteran’s Day weekend trip with friends. The balsamic is thick and luscious, slightly sweet and makes you think immediately that (at least) 534 beautiful, juicy cherries were incorporated into this very bottle. It is wonderful stuff. One day, I was lucky to be staring at the bottle in my cupboard at the same time I was thinking about holiday food gifts… and this recipe was born. So, balsamic vinegar… in fudge? A thousand times yes. Balsamic vinegar, reduced into a syrup, is a classic pairing with ripe, sweet fruit, most often strawberries. Vinegar in a recipe functions much the same as citrus, highlighting the flavors of the ingredients with which it is paired. Because balsamic vinegar has a very mellow-tasting acidity, it works to highlight the richness of the chocolate without overpowering it with a sharp, acidic flavor. The result is unexpected and elegant. Using a flavored balsamic, like the dark cherry I chose, adds another level of flavor– I adore cherries with chocolate. The finished fudge is accented with flaky sea salt, which looks as nice as it tastes. If you’re still not convinced, I will tell you that this fudge still looks and tastes just like classic fudge. There is a hint of cherry, a hint of almond, a hint of saltiness, but the vinegar flavor is not at all strong. In fact, it’s not really perceptible as vinegar, just as a kind of brightness, much the same as adding a little lemon juice to a cake. It doesn’t become a lemon cake, per se, but all the other ingredients are enhanced. This easy recipe produces one of the most exciting, interesting confections I have ever made. When I made a batch at Christmastime, it was fun to watch how folks reacted to the first bite. If I mentioned the balsamic ahead of time, there was some healthy skepticism about vinegar in fudge, though most people were still game to try. When I just offered a piece to try, without explanation, I got universally emphatic response. Even those friends who balked at eating the fudge at first agreed that it was a great flavor combination. I was so proud when my mom commented about it; she makes so many Christmas treats for family and friends (including dozens of pounds of chocolate and peanut butter fudge), but doesn’t eat many of them herself. Her words of praise about this fudge meant so much to me! If you’re looking to make something a little fancy, a lot unexpected, and quite delicious, I can’t think of a better place to start than this black cherry balsamic fudge. Line an 8″ x 8″ square pan with wax paper, leaving some hanging over each edge. Pour (or spoon) the fudge into your prepared pan. Use the spatula to press the mixture out to each corner, and smooth the top. I like to put a bit of a swirl pattern in to catch some salt pieces. Sprinkle the top conservatively with sea salt and refrigerate for two hours to set. Holding opposite corners of the wax paper, remove the fudge in a block from the pan to a cutting board. Trim the edges if you like, and cut into pieces. I generally get about 48 pieces, 4 rows of 12 rectangles, but you can make them larger or smaller as desired. Add a tiny bit more salt to the cut pieces if necessary, but don’t overdo it– a little goes a long way. I prefer to store this fudge in the freezer: it stays just soft enough, but lasts longer without blooming. It will keep for up to two months this way, though the salt does evaporate. *If you don’t have access to flavored vinegars, try a good quality aged balsamic instead. Otherwise, use any flavor you think would go well with semisweet chocolate. Monadnock has a fig balsamic I’m dying to try in this recipe. Espresso, vanilla, raspberry, blackberry, orange– let your imagination run wild. If you do move away from plain or cherry, depending on the flavor you choose, it might be best to omit the almond extract, or replace it with vanilla. Coconut bundt cake w/ orange & ginger. Posted by cookcanread in baking, you can freeze it! In the dark of winter, tropical flavors like coconut, ginger and citrus are as welcome as sunshine. Bundt cakes are a great vehicle for these flavors, and this one was inspired by the inimitable Dorie Greenspan. In her book Baking: From My Home to Yours, she has a coconut tea cake with several variations. It’s a straightforward recipe that can be as simple or fancy as you want; for my sweet-toothed husband, I added a light glaze and toasted coconut as decoration, but the cake stands tall without the extras. My variation of Dorie’s recipe has zing from citrus and candied ginger, warmth from dark rum, and creamy, nutty notes from coconut. As the original recipe’s name suggests, it’s perfect with tea or coffee as an afternoon snack, but I like a slice toasted for breakfast just as well. Spring is around the corner; until it arrives, add a little brightness to your kitchen with this wonderful coconut bundt cake. Start by toasting the coconut. In a dry skillet over medium to medium-high heat, add the coconut. Stir occasionally or shake the pan until the coconut toasts and becomes fragrant. Remove from the hot pan to a bowl or plate as soon as you achieve the color you like; it will continue cooking in the hot pan. Preheat the oven to 350 degrees and place an oven rack in the center of your oven. Carefully butter a 10- to 12-cup bundt pan and then dust with flour. Shake out any excess flour and check to see if you missed any spots; go back and butter them if you did. In a small saucepan, warm the coconut milk and butter until the butter melts. Remove from the heat and set aside. Sift together the flour, baking powder, salt and dried ginger. To the bowl of a stand mixer, add the eggs and sugar. Beat for 3-5 mins., until the mixture is thick and pale yellow. Add the orange zest and rum, then slow the mixer down to add the sifted dry ingredients. Scrape down the sides of the bowl at least once and stop mixing when you can no longer see dry flour. Add the candied ginger pieces and 3/4 c. of your toasted coconut to the batter and turn the mixer back on low speed. Stream in the warm coconut milk mixture. Stop the mixer when the batter looks uniform and give a few stirs with your spatula to ensure even mixing. Pour the batter into your prepared pan and tap a few times on the counter to even the batter and knock out any air bubbles. Bake for 45-60 mins., until the cake is golden brown and a skewer or knife comes out clean from the thickest part of the cake. The time will depend on your oven and pan shape. Cool for 30 mins. on a rack and then run a sharp knife around the edges and center cone and invert carefully onto a plate. Mix the juice of your orange with 2-3 T. powdered sugar to create a thin glaze. While the cake is warm, gently drizzle the top with glaze and allow it to run down the sides. Before the glaze hardens, sprinkle the remaining 1/4 c. toasted coconut over the top. Cool the cake completely and serve. Your coconut bundt will store for 2-3 days covered at room temperature or 4-5 days in the refrigerator. Without glaze, it can be frozen, tightly wrapped, for up to 3 months. My favorite granola, and a new job. Posted by cookcanread in baking, fruit, nuts, grains, pasta, you can freeze it! I got a new job! I don’t talk too much about my work here; it’s generally not related to anything I do in the kitchen, and I am very much a believer in work-life balance and my job being done when I leave my desk. I was thinking you may have noticed that my posting slowed down a bit, both here and on my Facebook page, and I wanted to explain why. I spent a good amount of time in September job searching, and most of October wrapping up my last position and getting started in my new office. It was an exhausting process and I didn’t do or think about much else for about six weeks. So far I am very happy with my decision to make a move. It’s a big change: I no longer work at home with my dog in my lap. (The worst part– I miss her so much.) But…my commute is absolutely manageable and my new coworkers are a good bunch. After two weeks, I feel like I am going to learn a great deal and be challenged. What more could I want? I have no plans to stop cook.can.read– I wouldn’t know how to quit! Being in the kitchen, working on new recipes and sharing them with you is my best creative outlet. I am so proud when I hear that my Apple Crumble Pie and Pork Sugo were made recently by two readers and turned out well for them. I love getting your feedback, questions and comments. Now that I am settling into a new routine, I will figure out a new plan and timetable for cooking and writing. Luckily, I have a few recipes lined up, just need to get them finalized and written up. I am going to thank you in advance for being patient and staying with me while I get settled. One of the aspects I had to relearn about actually going to work is packing a lunch. How funny– but I have been ten steps from my kitchen for the past four years and didn’t ever think about it. For the past two weeks, I have been doing my regular meal planning with work-friendly leftovers in mind: stews like pork verde, baked chicken, and soup so far. The first week, I bought nuts, dried fruit and pepitas to stash in my desk, and yogurt for the refrigerator. 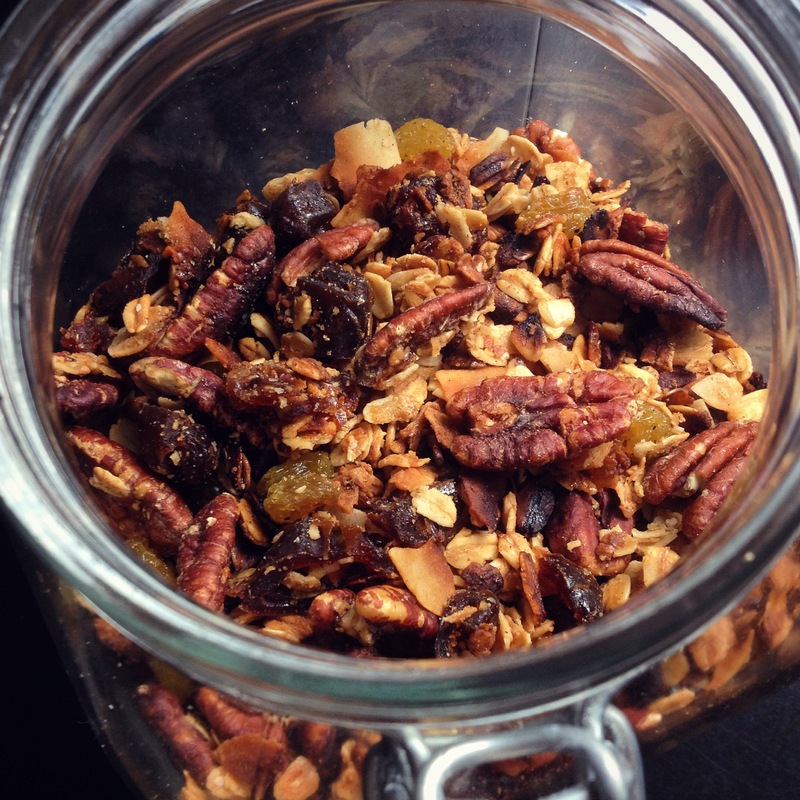 Last weekend I made a batch of my favorite granola and had an epiphany– I could keep some of this at work! It’s perfect for a quick snack on its own and delicious as a yogurt topper. This particular granola, flavored with maple syrup and cinnamon and full of toasted coconut, pecans, dates and raisins, has just the right amount of flavor and sweetness to make my preferred plain yogurt a protein-rich, delicious snack. This recipe makes about a three week supply for me when I’m eating it daily. Having a reliable granola recipe is a major win, in my opinion. I know exactly what’s in it and can customize for different moods, uses or snackers. I use coconut oil in place of canola sometimes and dried cranberries (or cherries, or blueberries) in place of raisins. No pecans on hand? Sub in almonds or walnuts, or a mix. Granola is fun to make and give away, and the holidays are just around the corner… I also love how cost-effective it is to make granola instead of buying it. You can buy large quantities of oatmeal and nuts (store those in the freezer so they last for a while) and find dried fruit on sale in the bulk section. I haven’t figured the exact savings of making versus buying, but I kind of want to– and will report back when I do. Whether you see it as the perfect snack to make and bring to work or send to school with your kids, or a way to jazz up your breakfast, give this granola recipe a try. Preheat the oven to 250 degrees. Cover a baking sheet with parchment paper. In a large mixing bowl, combine the oats, coconut flakes, pecans, oil, maple syrup, cinnamon and salt. Mix well. Turn the mixture out onto your baking sheet and spread it into an even layer. Cool the granola on the pan for about 30 mins. Scatter the raisins and dates over the top and then transfer to a well-sealed container for storage. I have a big glass jar that works very well, but any container will do as long as it seals out moisture. The granola will keep for about a month in a dark, cool cupboard. *I tend to go for 1 hr at 250 degrees and then 30 mins. at 350 degrees, because I like my granola very toasted, almost burnt on the edges. The picture above represents my cooking preference. When I am baking it for other people, I stop after 15 mins. at 350 degrees.